Here are 3 free cryptocurrency tracker software for desktop. You will be able to track almost all cryptocurrencies or digital currencies (like Bitcoin, Ethereum, Altcoins, Bitcoin Gold, Litecoin, Zcash, Ripple, Neo, Ethereum Classic, OmiseGo, AdEx, Qtum, Monero, etc.). 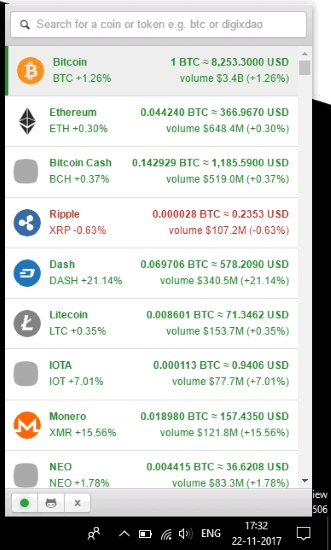 These free cryptocurrency tracker software let you check current price of each cryptocurrency, how much a cryptocurrency is worth to its Base Currency (USD), rise/fall in cryptocurrencies, symbol of each cryptocurrency, etc. Some of these free cryptocurrency or digital currency tracker software also provide other interesting features. For example, you can search for a specific cryptocurrency, view logo of each cryptocurrency, check total values of multiple cryptocurrencies by adding custom values for each cryptocurrency, set reminder for a cryptocurrency, etc. Let’s start with the first free cryptocurrency tracker software available in this list. 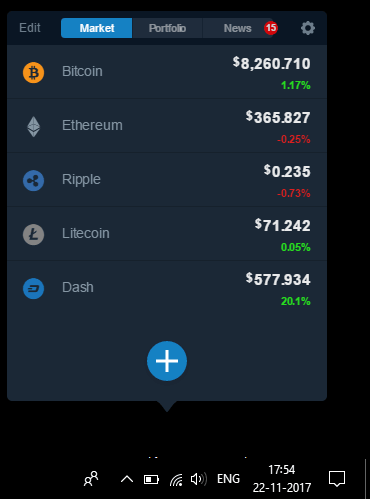 If you are looking for a very simple and portable cryptocurrency tracker software, then Crypto Price Widget is a nice choice. It comes as a widget and shows the present value of input cryptocurrencies on its beautiful interface. By default, it shows only Bitcoin cryptocurrency and base price is calculated in USD (Base Currency). But, you can add more cryptocurrencies and set the Base Currency as per your requirements. More than 20 most traded currencies (USD, EUR, JPY, INR, ) are supported to set as Base Currency. It also lets you arrange the positions of cryptocurrencies by dragging and dropping them. Thus, you can add and sort the list of cryptocurrencies as per your choice. On its interface, you can see the symbol of each input cryptocurrency, their current price, and change (high/low) in each individual cryptocurrency. The information is updated or refreshed automatically after every 5 seconds and information is also almost accurate. Another interesting feature is that you can manually calculate the price of different cryptocurrencies (in total). You can set a custom value for cryptocurrencies of your choice and it will show their total values along with a beautiful pie chart. You won’t be able to export the list but it is handy to check how much a particular or multiple cryptocurrencies are worth. Its interface can also be placed always on top of other windows. Overall, I can say it is a very useful cryptocurrency tracker software and I like it very much. Mammon is another fantastic and free cryptocurrency software for desktop. It silently sits in the system tray and shows the current price and rise/fall (in percentage) for a particular cryptocurrency. By default, its interface shows 5 cryptocurrencies, but you can add more as per your needs. The information is updated daily, hourly, or daily+hourly basis (based on the option set by you). Apart from tracking the cryptocurrencies, it also lets you calculate the total money you have for cryptocurrencies of your choice. You can add values for each cryptocurrency of your choice and then it will show you the total worth (in USD). One unique feature that I like is you can set the reminder for a particular cryptocurrency when its price hits the target set by you. So, let’s say if Bitcoin price hits larger than or smaller than the value set by you, then it will show you the reminder. It has really good features and therefore it is worth trying. Donut is the simplest cryptocurrency tracker software in this list. There is nothing to do from user end as its beautiful interface automatically shows the list of all cryptocurrencies. You can see the current price of top cryptocurrency and rest of the cryptocurrencies. Apart from that, it lets you see how much a cryptocurrency is worth to its Base Currency (which is USD). You can’t add or remove cryptocurrencies or check the total value of multiple cryptocurrencies by adding custom values. Still, the software is very good to track cryptocurrencies and get the updated information. The software automatically fetches the data and then updates information which is visible to you about cryptocurrencies on its interface. You will also be able to see the total value of each cryptocurrency, symbol, logo, and high/low for each cryptocurrency. One more feature that is very useful is you can search for a particular Cryptocurrency using the Search feature. So, instead of scrolling down the whole list, you can quickly view the information of a particular cryptocurrency using the Search box. You may also check the list of best free Bitcoin wallet software covered by us. So, these are some very useful and free cryptocurrency tracker software for desktop. All are simply good as they provide updated information about cryptocurrencies. Still, my favorite is “Crypto Price Widget” software, and it deserves #1 position on this list. It gives the options to add cryptocurrencies of your choice, check their values as per your requirements, and data is updated automatically after every 5 seconds. You may try all these free cryptocurrency trackers and share your opinion using the Comments section.